What does a producer do, exactly? More to the point, why are there so many different types of producers in film, TV, and video production? Do you know the difference between a producer versus an executive producer? How about a co-producer, associate producer, or TV producer? Some of the distinctions won’t be cut-and-dry, but understanding who’s usually in charge of what is crucial for any TV and film professional. Here, we give you a complete guide to all types of producers and what they do. Let’s get started. How to become a producer? A producer is an individual who aids in the development, planning, execution, and marketing of a feature film. A producer initiates, coordinates, supervises and manages the creation and production of movies, television shows, web series, and commercial videos, amongst other productions. A producer may be a self-employed contractor, or subject to the authority of an employer such as a production company or studio. They are involved throughout all phases of production from inception to completion, including coordination, supervision, and control of finances, talent, and crafts. In the modern era where "everyone is a publisher," job opportunities for producers are growing. The Bureau of Labor Statistics projects that employment of producers and directors will increase 12 percent from 2016 to 2026, faster than the national average for all occupations. Bottom line: A producer is anyone who brings the project to fruition and is often the person that holds the rights to the underlying property. Purchase and develop projects. If applicable, producers secure the rights to projects. Hire and manage key team members, including writers, directors, managers, talent, heads of department, key crew, staff, and other personnel. Set a budget, and secure funds for the project, often through investors, personal funds or a studio. After funding, producers oversee the project to ensure it stays within budget. Build a schedule using production management software to set the production schedule. Oversee post-production from editing, through music composition and picture lock. Market the project and generate buzz for the project by working with a PR team. What is the role of a producer on a production? A true producer works with the project from the idea stage to the DVD shelf (or streaming queue). From the script draft on the laptop screen at a coffee shop to the wide screen of the theater and beyond. A good producer is with the project from before the cradle to long after the grave. Answering the question, "What does a producer do?" You might have thought such dedication would only come from a director. Sure, on an indie passion project, it may be the case. In a more traditional production like television or commercial shoots, directors are less of a permanent part of the project's lifespan than the producer(s). What does producer mean to the Producer’s Guild of America (PGA)? The guild defines the various rules that define the role of a producer, and even provide some wordy breakdowns in their FAQ of the different types of producers. Irving Thalberg, arguably the most important producer in movie history, once said: "A credit you give yourself is not worth having." Maybe his refusal to be credited adds to the mystery of the producer role. The role of a producer transcends any single credit. Okay, what does a producer do? The short answer: a little bit of everything. The longer answer begins at the beginning. As mentioned above, producers are often present at the inception of a story. The key role of the producer early on is to "develop" the material. Getting it ready for production. It could start with a news article ... something in the public domain. A book. A ​compelling logline. A spec script. Another movie. When inspiration sparks, the producer is the one holding the flint to the kindling. We know the producer isn’t usually a writer though. So at this early development stage what exactly does a producer do? Before he was a mega-producer, Brian Grazer came up with a concept for a movie about a man who falls in love with a mermaid. Grazer knew he wasn't much of a writer, but he believed in this idea. So he hired a writer to write the screenplay. Together they 'developed' the project. It became Splash and helped launch many careers. What does a good producer do? They launch careers. T.Hanks for being a great producer, Brian! Producers can also purchase a script. In the early 1960s, author Ken Kesey wrote a play starring Kirk Douglas, who later bought the film rights. This is referred to as "optioning," because the buyer is purchasing the "option" to turn the material into a movie. Here is a little more info on how to option a book. Years went by, and Douglas passed the rights to the option on the play to his son, Michael. Michael Douglas brought in a more seasoned producing partner, Saul Zaentz, and the Oscar-winning film One Flew Over the Cuckoo’s Nest was born. What does a Producer do? Sometimes accept the Academy Award for Best Picture. A producer will then hire a director, and attach stars. These steps often help secure funding — another task that falls to the producer. With funding in place, a producer will make or oversee the budget. For more on that check out this guide for crafting film budgets. High-level producers have the closest relationship to the film’s financing. Understanding how to manage the film's budget and cash flow is critical to being a Producer at any level. So what does a producer do next? Crew up, and then manage all that arises during the shoot. Somewhere around this point, essential heads of department join the project, such as the director of photography and 1st assistant director. The budget, script breakdown and shooting schedules are firmed up at this stage. Additional staff and crew are hired. Obviously, a producer needs to have an extensive Rolodex of contacts. Grow and manage your production contacts with professional producer software. 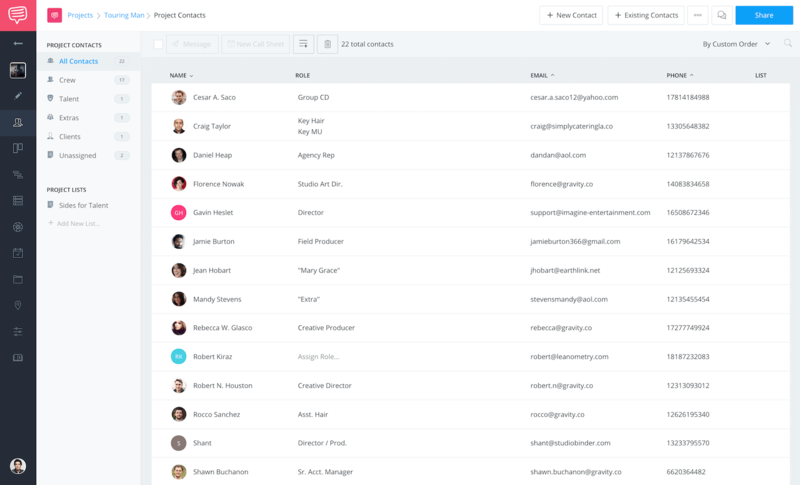 Keeping contacts in your production hub makes for an easier process at every phase. You can divvy up people by department, project, and other custom considerations. Get in touch via messages within the software itself, or use cast and crew info to call and email. Plus, when you move into production and generate call sheets, all you'll have to do is select your contacts to send and confirm receipt via your built-in tools. After wrapping a shoot, a lot of the key talent moves on to new projects. The cast and crew will likely have other jobs to jump right into. The director may also start prepping his or her next film. And what does a producer do when everyone starts to disperse? He or she sticks with this project and sees it through post-production. Editorial teams assemble a rough cut, with the director around as much as he or she wishes to be (or is allowed to be). Then, there is a final cut, final VFX, color grading, the film score, and audio work. A producer stays on top of it all. The role of a producer will then turn towards test screenings and even making changes at this late date, if necessary. Producer Robert Evans screened The Godfather and notoriously yelled at Francis Ford Coppola. In an unusual request, Evans wanted the would-be classic recut to be longer. He wanted an "epic." With the movie in the can, what does a producer do after that? It's one thing to make a movie. It's another thing to get people to see it. With a film is finished, the producer(s) initiate marketing campaigns. Talent will come back into the fold now. Often times public relations firms get involved as well. Promotional tie-ins. Etc. Producer George Lucas made a galaxy-altering decision during this phase. He negotiated to retain merchandising rights to his then-unheard-of space opera Star Wars. At the time, film merchandising was not seen as a moneymaker. This is where George Lucas donned his producer cap. He used the idea of manufacturing toys based on his film to build up anticipation for the film's release and beyond. The studio executive producers laughed at Lucas's "worthless" request and granted the rights. Approach filmmaking like a movie producer and you can save the galaxy. We've covered some broad strokes. But we've left something critical out. There are many different kinds of producers. You've noticed on your movie poster that there are two to three different types of producers. You've probably seen that film credits order hierarchy features many types of producer roles. What does a fill-in-the-blank producer do? Now it's time to explore the various types of producers in the industry. To understand the difference between a producer and executive producer, let's start at the top: What do executive producers do? An executive producer (EP) is the head producer who supervises other producers in the creation of a film, television show, web series, commercial, or theater performance. An executive producer may work independently or on behalf of the studio, financiers or the distributors. They will ensure the film is completed on time, within budget, and to agreed artistic and technical standards. In television, an Executive Producer may also be the Creator / Writer of the series. Bottom line: An executive producer is usually a financier of the project. Typically, this person may assemble the core team, but will not physically produce the project. Introduce new concepts and ideas that may align with brand initiatives of the project. Ensure production meets competitive goals and projects the intended brand image. Supervise other producers and ensure they, and the production, work within union regulations. Oversee and approve the hiring of marquee talent. Maintain the budget and approve schedules. An executive producer (EP) typically works only at the highest level. They may be a producer who has raised a significant proportion of a film's finance, or who has secured the underlying rights to the project. In major productions, the executive producer may be a representative or CEO of the studio. Typically, executive producers are not involved in the technical aspects of the filmmaking process but play a crucial financial role in ensuring that the project is completed. They may raise some money for the film, commercial or series. They may also put up the money and be looking for a return on their investment. These types of executive producers actually don't do much on the film itself. There may be several executive producers on a film who may take the lead role in many areas, such as development, financing or production. In many instances, the executive producer oversees the project. There may be a few places where some executive producers will have a larger hand. Say in the cutting room. Attaching major stars. Negotiating. Some EP's may do this for multiple films at once, working for a studio or conglomerate. But it's best to think of the executive producer as someone working at the global level. A hand in everything. Power over much of the process. But not likely to dip into the details. Ok. That answers for one type. But what do these other movie producers do? A co-producer typically works right beneath the executive producer or producer. They'll assist with finances, casting, post-production and other high-level tasks. A co-producer is a producer who performs jointly with another producer on a production. Additionally, a co-producer title may be awarded to any key player (such as a DP, department chief, or talent) who may not have a direct hand in producing the project, but is instrumental in funding the project through their involvement, equipment, or services rendered. ​Work jointly with another producer to oversee the project from development through post-production (see producer responsibilities in the previous section). Provide notable value to project through their attachment, services rendered, essential equipment, locations, etc. Any producer credited like this is considered “above the line” – a phrase used to delineate high-level decision-makers and talent. Any producer credited like this is considered “above the line” – a phrase used to delineate high-level decision makers and talent. This line brings us to our next type of producer: the line producer. A line producer's domain is all that happens below the line. In other words, above-the-line producers hire the line producer to oversee everything below the line. A line producer performs all producer functions involved in supervising the physical aspects of the making of a motion picture or television production. Unit production managers (UPMs), who perform no more than the standard services of a unit production manager, should be credited only as such. Bottom line: A line producer focuses on production. Assist with the hiring of marquee talent. Supervise the post-production process and liaise with the executive producer. Producers of all kinds oversee. While they may take on the tasks of say, making a schedule or budget, they typically do so only once the big ticket items (above-the-line talent) is secured. They may rough out the shooting schedule and script breakdowns, and hand it off to the first AD to finish and finalize. Then the above-the-line Producer will take a look. And perhaps run it by a higher up producer such as an executive producer. What is a line producer? What does a line producer do? So as you can see in the video above, the answer to what does a producer do could very well be "everything." If the project is small and the money tight, the producer has to do it all. If the project is huge, with a gargantuan budget to match, then there may be lots of producers running around. And in the case of a large project, the answer could be in some cases "nothing." Because maybe he just works at the production company helping finance the film, and he’s never even read the script. Often you'll hear that an associate producer credit isn't a “real” credit. It could be a friend of someone high up. It could be someone the production owes a favor to. It could be someone who did some amount of work on the production, but that is more likely the outlier. An associate producer, often referred to as the 'AP," is a below-the-line producer that performs under the supervision of another producer. Associate producer job duties and responsibilities will vary from project to project and may include organizing production personnel, coordinating set construction, operating a teleprompter, supervising lighting or sound plans, editing scripts, or writing news items. An associate producer is not necessarily a member of the Producer's Guild (PGA) and is often hired only to do tasks that other union positions don't have to do. Bottom line: An associate producer may have a hand in the process, but will not be physically producing it. It's often used as a token title to appease a writer, production executive, underlying rights holder, or someone that offers a vital favor in exchange for a credit. On a TV series, associate producer duties may include pitching story ideas, revising copy, and helping guide the editorial content of the series. Writing, editing, organizing scripts for TV, running the teleprompter in newscasts, or assisting the editor by making beat calls (shot selections). Assist with promotions and handle bookings for TV. On a film production, an associate producer's duties are varied and difficult to pin down. Like many producer credits, associate producer is one that can be a part of a negotiation. Say on a film someone let you use a location they owned for free, or heavily discounted. You might throw in an associate producer credit. Why is it a credit worth getting? Because a lot of people don't really understand what is a producer. Or what a producer does. There is little to no difference between an associate producer or co-producer for many. ​Within the confines of the industry, people will more than likely know what a producer did on a project, often by way of the individual’s skill set, or work history. But for much of the world, defining the role of a producer isn't straightforward. To them, all producers are the same, and no one is quite sure what it is they are up to. 8. WHAT DOES A TV PRODUCER DO? Now we know what the various movie producers do. But how is it different from their counterpart in TV? Now, what does a producer do on a TV show? In television, a producer is often a writer. In the case of an executive producer in television, it's a "head writer." You could almost think of the "EP" or "showrunner" as they are more commonly called, as some director-producer-writer hybrid. TV producers are responsible for a variety of operation on network shows. Typically, a TV producer is tasked with concept development, raising funds, recruiting staff, budgeting, guiding crew members, making casting decisions, and evaluating final product quality. A television producer assists the executive producer(s). A producer in television is a creative decision maker, and not so often involved in nuts and bolts of the day-to-day. Though they may have a hand in that, too. Aaron Sorkin (West Wing, The Newsroom), Vince Gilligan (Breaking Bad), Carlton Cuse (Lost / Bates Motel), Matthew Weiner (Mad Men), Ann Biderman (NYPD Blue), Nic Pizzolatto (True Detective). 9. HOW DO YOU BECOME A PRODUCER? This is an important question. Now that we understand the film producer job description, how do we get started? How do you become a film or TV producer? Many producers come from humble beginnings. And for a good reason. A producer needs to know a little bit of everything happening in the filmmaking process. Some start in the mailroom. Some begin as production assistants. Irving Thalberg, as mentioned earlier, was a secretary who became head of production at MGM. In those days, the studio was the king of movies, and MGM was the king of studios. Walt Disney started with an entry-level job “inking” at an art studio. Mogul David O. Selznick started as a script reader. By learning the craft from the ground up, a producer learns every inch of the process. And as we've seen, that'll be critical to success. But what's the fastest way to learn the facets of pre-production and production? We're a little biased, but a really good way is to familiarize yourself with production management software like StudioBinder, which is made for producers. StudioBinder guides you through pre-production and production workflow step-by-step by providing tools to create and collaborate around the critical documents that productions need. From shooting scripts, sides, breakdowns, shooting schedules, shot lists, calendars, call sheets, and more. It's the most efficient way to master the producer's workflow. Okay, so say you have some experience in the field, and you'd like to cut your producing teeth. But what does a producer do to jump-start a producing career? One great option is to start working on student projects. You can also search for low-no budget shorts and offer producer services. Projects such as these often have a serious need for good producers. The struggle of shooting on a shoestring will help a producer learn to adapt on-the-fly and plan for everything. If you can stomach the hard work (often to get paid with experience only), this is a reliable route to try. Brush up on what a working production coordinator should know and apply some of that knowledge to a low budget producing gig. Wondering what does a producer do on set? They prepare, and they lead. A big part of being prepared is using pre-production software to prep your projects, from scheduling the shoot, to budgeting to call sheets. Producers need to know how to organize all the elements of a film. Make a free shooting schedule in StudioBinder. Put together a stripboard. Even try creating a free call sheet to hone your chops. Practicing and developing these skills will make you more hirable. Nothing will make you better at being a producer than starting to produce. Create a free career profile on a film & TV production job board like ProductionBeast, and submit your services. Search for video producer jobs. And when you are producing your next project, you use also ProductionBeast to crew up your own shoots. We’ve learned what a producer does in film and TV. One constant: the producer always helps facilitate the creation of the project. Ever hear the phrase “development hell?” Development hell is when a project is stuck at one stage, unable to go anywhere else. Only a producer can rescue a project from development hell. When it's time to dig into the nuts-and-bolts of producing, you need a deep knowledge of line producer duties. Get the complete guide in our next post.